Atlas Copco introduces its HiLight V5+ LED light tower that features its HardHat canopy and a compact footprint. Atlas Copco Construction Equipment launched two new light towers — the HiLight V4 and the LED HiLight V5+. The HiLight V5+ minimizes operational costs with its long-lasting LED bulbs and fuelefficient operation. The HiLight V4 features four metal-halide floodlights to give contractors a dependable light source for a variety of job sites. Both models are lightweight, compact and feature Atlas Copco's HardHat canopy for extreme durability in rugged applications, such as construction and roadbuilding. The LED floodlights are rated for 10,000 hours and are durable to withstand a range of challenges, from vibrations during transport to harsh work environments. Contractors with a fleet of 200 light towers, for example, can save as many as 600 bulbs each year when switching from metal-halide light towers to the HiLight V5+. Contractors save on fuel costs, as well, due to the tower's key components — the LED floodlights, 3-kilowatt generator and Tier IV Final Kubota diesel engine that operates at 1,800 rpm. The combination of these components allows the unit to achieve runtimes as long as 140 hours, while minimizing fuel consumption on nighttime projects. Atlas Copco's HiLight V4 also has a Tier IV Final Kubota diesel engine with a 6-kilowatt generator to power four metal-halide floodlights. The retractable, vertical mast on the HiLight V4 and HiLight V5+ make them easy to transport. The vertical mast design, coupled with the compact engine, results in an extremely small footprint, allowing as many as 20 units on a 53-ft. trailer. Both of the light towers' trailers feature a lifting beam with fork pockets and a heavy-duty lifting eye for easy loading and unloading. The trailers' combination hitch — a feature that comes standard with the light tower — ensures that operators can move a tower with a pickup and either a pintle or ball receiver mount. The vertical masts also contribute to worksite safety. Contractors use the V4's 2,500-lb. (1,134 kg) or the V5+'s 3,500-lb. (1,587 kg) winch to raise the masts' five sections to the maximum height of 25 ft. (7.6 m). Horizontal masts, on the other hand, require two winches — one to extend the mast and the other to raise it from horizontal to vertical. The vertical masts eliminate the risk of the masts tipping backward and expedite setup times. Once extended, the floodlights rotate 360 degrees and generate as much as 440,000 Lumens to easily illuminate any section of a job site. The light towers' HardHat canopies, a common feature on Atlas Copco portable air compressors, are a durable, lightweight alternative to steel and ABS (acrylonitrile butadiene styrene) thermoplastic canopies. The polyethylene HardHat canopy withstands corrosion, dents and fading, providing ongoing protection of the engine and overall unit while keeping the resale value high. Unlike ABS canopies, the HardHat canopy will not crack on impact with debris or other materials, according to the manufacturer. Atlas Copco designed the light towers for easy serviceability and longevity. Technicians can flip open the unit's gull-wing doors for fast and easy access to the engine and electrical components. Its control and power panel have independent circuit breakers that protect the electrical circuit if overloading or a short circuit occurs. The panel also incorporates an hour meter for accurate service scheduling. The tower's galvanized steel mast prevents rust and features block spacers to reduce friction and minimize wear while raising and lowering the mast. The tower's spill-free frame with full fluid containment prevents worksite contamination if a leak occurs. When the V4 and V5+'s lights are not in use, contractors can power electric handheld tools using the light towers' duplex 120-volt AC auxiliary receptacles. 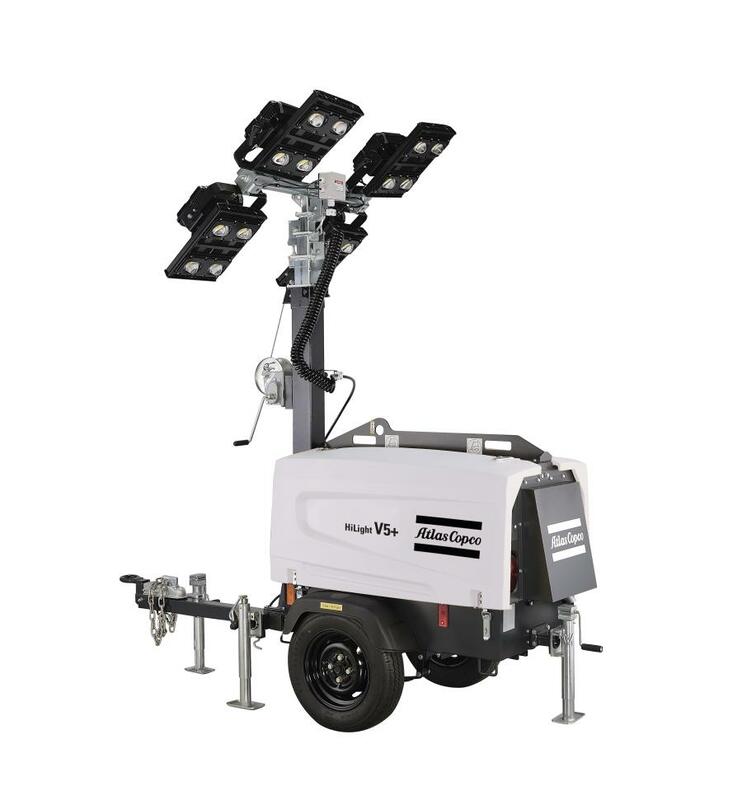 Equipment dealers can offer customers multiple options for tailoring the HiLight V5+ and HiLight V4 light towers to applications and requirements. For instance, customers can choose to include an electric winch, emergency stop button, ground connection, engine block heater or spark arrestor.